The Pizza Press is the most exciting way for you to make your own pizza! Our restaurant has the absolute freshest, most delicious ingredients available anywhere and we let you tell our chefs exactly what you’d like on top of your fresh pizza and they make it in front of you, or choose from one of our spectacular recipes. 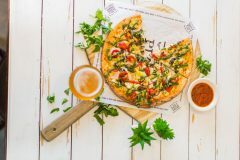 Hang out and have a great time in our newspaper-themed restaurants by eating delicious pizza and enjoying tasty salads and a wide selection of craft beers! We have locations all across California and we’re opening new pizzerias all the time, so come visit us soon and publish your own pizza!